The Royal Academy of Arts has unveiled a series of installations that show how virtual and augmented reality technologies can change the experience of buildings and spaces. The four installations were created by architect Gilles Retsin, 3D-scanning studio ScanLAB, designer Keiichi Matsuda and design studio Soft Bodies. Together they form the third and final instalment of Invisible Landscapes, a project by RA curator Gonzalo Herrero Delicado exploring how digital technologies are changing the world. "The last act of Invisible Landscapes explores how the virtual might transform the physical space and vice versa," the curator explained. "Four works, including two new commissions, explore how virtual, augmented and mixed reality are blurring the boundaries between the physical and the virtual, and questioning what is real and what is fictional, questioning how we might interact with and look at the world around us, both now and in the near future." Real Virtuality was a new commission from Bartlett School of Architecture tutor Gilles Retsin, whose previous works include a robot-built chair made using a 3D printer, and prototypes for a 3D-printed plastic house. 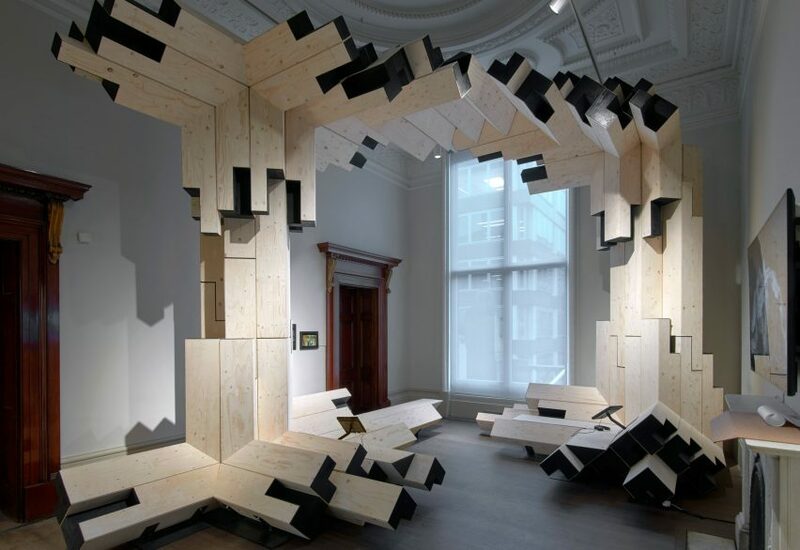 The London-based architect combined plywood with digital technology and augmented reality construction techniques, to design and install an interlocking wooden frame inside the Royal Academy's architecture gallery. Each building block was made from nine- by 12-millimetre plywood sheets, turned into a kit of parts using a CNC milling machine. These modular forms were then assembled by people wearing Microsoft HoloLens headsets, which allowed for real-time adaptions as the installation was being built. The HoloLens overlaid a digital model of the design onto the gallery space as the construction team looked at the room, indicating where each plywood module could fit. The entire structure was held together in tension, with a few lateral steel rods in repeating points between the plywood elements. The piece by 3D scanning company ScanLAB Projects, Post-Lenticular Landscapes, comprised a diorama viewable through a holographic lens. The team took terrestrial laser 3D scanning equipment to Yosemite National Park in the US to produce a hologram of the landscape, recreating the 1870s expeditions of pioneering photographer Eadweard Muybridge. London designer Keiichi Matsuda presented his dystopian 360-degree short film Merger, which imagines how augmented reality and an obsession with productivity could merge to create a nightmarish new workplace. Weightless Bricks is a new commission from design studio Soft Bodies. The mixed-reality experience allows participants wearing a virtual-reality headset to explore a digital landscape whilst interacting with specially made physical objects in a hybrid world. AR and VR experiences are increasingly being used by museums to give visitors new way to encounter their exhibits. In the Netherlands, visitors to the Mauritshuis museum can use their smartphones to simulate stepping inside the world of the painting, while performance artist Marina Abramović created a virtual avatar for a mixed-reality performance art piece at the Serpentine Gallery in London. Photography is by Andy Keate unless otherwise stated.